For the past few years, I have secretly wanted a kitschy fake white Christmas tree. Until this year, I haven't been in the right living space to make a legit tree happen. 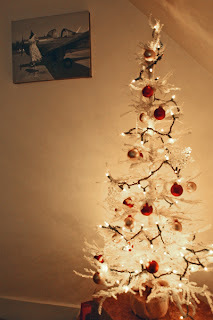 I decided to splurge (except, I only spent $25) on a 48" tall, fake, white, awesome Christmas tree for my living room. Why a white Christmas tree? Well, I am going to have plenty of time to get a real tree later in life, so I am indulging in the frivolity and ridiculousness of the white Christmas tree while I can. I got pretty amber lights for it, but Rookie Mistake #1 was that I bought them on green wire instead of white. Oh well. I also still need the right star for the top. I could not find one the other night when I was looking for the trimmings. But otherwise, I'm pretty excited! Next feat: Start a lifetime collection of ornaments. While the matching ornament style is nice and uniform and orderly looking, I do love a haphazard Christmas tree with random ornaments that have been collected over the years. What kind of Christmas tree do YOU love? I love the collection of ornaments... my husband and I started our own collection by getting an ornament on each of our vacations... it's fun when we trim the tree each year to remember our trips.